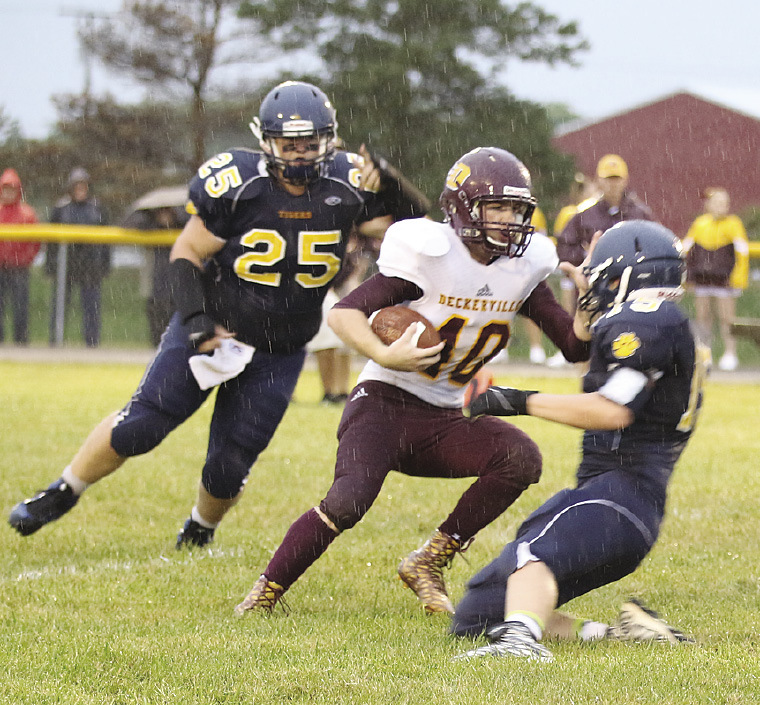 The Deckerville Eagles got their second win of the season on the road, when they defeated the CPS Tigers, 54-0. The Eagles scored two touchdowns in the first quarter, on a Jared Philpot 2-yard run, with an Austin Spaetzel PAT and an Austin Fritch 3-yard run, with the PAT failing. A weather delay didn’t stop the Eagles from scoring in the second quarter – getting four touchdowns. Chase Pattullo had a 16-yard run for six, with Wyatt Janowiak getting the PAT. Philpot scored on a 4-yard pass from Brandon Pattullo, and he also got the PAT. Pattullo connected with Janowiak with a 39-yard pass for the third touchdown in the second quarter. Wade Saldana got the PAT. Philpot ran in the fourth touchdown in the quarter with a 59-yard run. Saldana got his second PAT. In the third quarter, Cole Romzek got the final touchdown for the Eagles, with a 4-yard run. Cruz Ibarra finished the scoring for the night with a PAT. Jared Philpot led the Eagles rushing, 8-117, Austin Fritch was 7-17; Brandon Pattullo 5-22; Chris Franzel 1-4; Wade Saldana 2-10; Austin Spaetzel 2-13; Brenden Handley 2-38; Cole Romzek 4-16; and Cruz Ibarra 3-29. Pattullo was 5-2-43 passing for the night. Deckerville had 8 first downs, were 39-266 rushing, 5-2-43 passing, for 309 yards for the night. CPS had one first down, rushed 19 times for -37 yards, and were 12-3-20 passing. The Eagles will play at home this Friday, when they take on Marion. 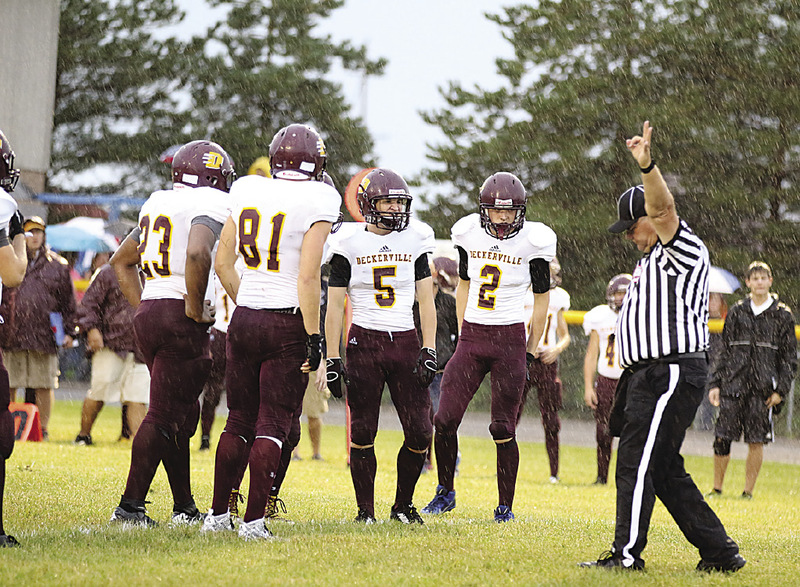 #23 Donovin Snyder, #81 Austin Spaetzel, #5 Austin Fritch and #2 Lukas Auerswald watch the referee step off yardage at the 54-0 win against the CPS Tigers.